Sinking your teeth into that copper wire to remove the insulation layer does more harm than good. You risk paying a huge dental bill that could have otherwise been used to buy wire stripping machines. Forget your teeth or knife since there are other great options out there that pose no danger. From manual, gauged, to electric wire stripping machines, there are many options out there designed for speed, accuracy, and durability. So what’s the right wire stripping machine to use? Well, the choice will largely depend on the size of wire and whether you want a machine that operates manually or automatically. Already made a decision on the type of wire stripping machines you want? 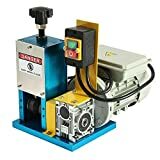 If yes, then feel free to choose from our list of the best wire stripping machines for that model that will work flawlessly without being overly expensive. 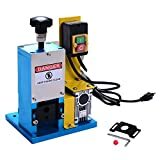 This wire stripping machine is designed to be used while mounted on a bench top. The stripping process is done using manually using a hand crank or automatically using a power drill. In the automatic mode, this machine has a stripping rate of 450 inches per minute. It has a wire capacity of 3mm to 25mm. This is a manual wire stripping machine. It’s designed for use with moderate insulation layers that are neither too hard nor too soft. The machine works via a hand crank mechanism that eliminates the need for pulling wires. It has a stripping range of 9AWG to 4AWG. Wires with outside diameter of 3mm to 8mm need to be put through aluminum ring prior to stripping. This is a solid, lightweight machine that’s portable enough to be used just about anywhere. The frame is made of machined aluminum to ensure it lasts longer. This automatic wire stripping machine is made to the industrial standard. It uses a power drill so no effort is required. This machine has a stripping rate that is 33% faster compared to other automatic wire strippers in its class. It accepts both Romex and braided wires from 18 gauge to 250 MCM. 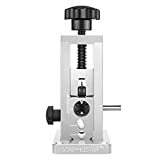 The frame of this machine is made of aircraft grade aluminum resistant to bending and distortion. This machine lets you separate removes the jacket from copper wire in just one stroke. It’s a manual wire stripping machine designed to double the work speed. An input guide straightens the wire and aligns it automatically so it doesn’t derail. This feature makes it a good option for tangled or kinked wires. There’s some form of jig that allows the blade to be sharpened with ease once it becomes dull. This machine accepts wires from 24 AWG to 250 cm. It can be clamped on a bench to provide a sturdy work surface. 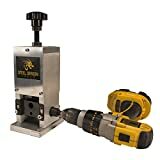 Save yourself the strain with this electric wire stripping machine. It’s an energy-efficient option that comes lightweight for easy portability. Equipped with a heavy-duty gearbox, it provides the precision and durability you need in a wire stripping machine. There are 3 different feed holes that accept wire sizes of 3mm to 25mm. This machine is specially designed to be used on undamaged scrap wires. The stripping rate is 50 feet per minute. Hardin WS-1270 is a versatile manual wire stripping machine. It accepts wires of all shapes ranging from Romex, parallel, triangular, to a square. The blade and rollers of this machine can be adjusted independently to accommodate wires from 24 AWG to 7/8 inches. You can bolt or clamp the machine to a workbench to get the stability you need. The mounting hardware is included for the purpose. The blade of this machine can be re-sharpened to maintain the good performance. This automatic wire stripping machine is designed to be used on undamaged scrap wires. It uses an electric motor that connects to a heavy duty gearbox to make quick work of tough insulations. The distance between the blade and shaft can be adjusted to accommodate wires from 3mm to 25mm. The stripping speed of this machine is 50 feet per minute. At 30 pounds, this electric stripping machine still remains a portable option. The blades can be re-sharpened for better edge retention. This machine is built for speed. It’s fitted with a single phase induction motor designed to run on any wall outlet. The machine doesn’t use much energy and comes portable for use in different work sites. It accepts wires from14 gauge to 1-14 inches. You get a stripping speed of 60 feet per minute. The blades can be adjusted for more precision and accuracy. There are 3 different feed holes that can be adjusted to the size of the wire to keep it from swinging. 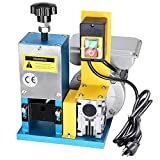 This 1800 watt wire stripping machine comes compact with a fine appearance. The frame of the machine is made of aluminum alloy optimized for durability. There are 2 different feed holes that keep the wire straight as the insulation is removed. Easy blade adjustment leads to better productivity. This machine accommodates wires from 1.5mm to 25mm. It comes portable for easy relocation from one job site to another. 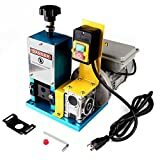 Beginners might find this wire stripping machine quite a noble choice. It comes with a new improved design that adds more simplicity in the stripping process while remaining strong and durable. The machine accepts both solid and stranded wires from 3/32 inches to 1-1/2 inches. Adjustable clamps come in handy to provide better grip. The blade can be changed with ease for added convenience. Made of a special alloy material, the blade of this stripping machine lasts much longer. 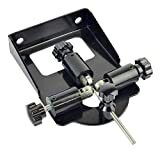 The machine can be bolted or clamped on a bench top to provide a sturdy work surface.